So I've been reading a lot of short fiction lately, for my new column in Salon Futura. (I've already turned in my second column, and I'm quite proud of it.) Now, it's hard to keep track of everything you need, unless you're one of those people with picture-perfect memories. I'm not. So I have a multi-tiered, way over-complicated system for keeping track that involves a Moleskein notebook and some Google doc spreadsheets. Why spreadsheets? Because I'm a stone-cold geek at heart, and it helps me keep myself amused by the whole project. I have just finished my 100th short story since I started keeping track (which milestone would've passed me by without the Master Spreadsheet), and I've got some nice crunchy numbers to share. Unsurprisingly I prefer SF, but only by a slight margin. I'm trying to cast my net as widely as possible, but I'm afraid I'll never be a horror fan. By the way, I assign every story to one-and-only-one genre, because that's how I keep the master count of stories read. ...&c. In another gender-related note, I've been keeping track of stories that pass the Bechdel test: 20. I've also found 16 protagonists that are human and identified by non-white ethnic markers, ranging from Indian to Mexican, Chinese, Philippino, etc. Other protagonists include Aliens (3), Djinn (1), Fairies (1), and Demons (2). Obviously the Mid future/Far future line is quite fuzzy, but either way it's hugely outnumbered by stories set in the Earth's present and near future. And long-range futures are almost balanced by stories set in Earth's past--a slightly disturbing trend for the genre if it holds up. Other places on Earth include: India (2), Africa (3), England (2). And with one appearance each: Philippines, Burma, Antarctica, Japan, Thailand, Russia, Mexico, China, and Morocco. For more exotic settings all we've got are: Space (4), Extrasolar planets (5), Spaceships (1), Elsewhere in our solar system (3), VR (1) and the Ocean (1). And the Afterlife (1). None of the others have more than 5 showings, and I don't want to bore you with the whole list (93 items and counting). What does all this add up to? Not much, I just think it's interesting. You might as well. And of course it's all skewed; I've read 4 steampunk stories so far, but if I picked up a steampunk specialty issue of a magazine or a theme anthology that would jump way up. By the way, here are the venues that I've peeked into so far (although I haven't read every recent story in every venue, not by a long shot). If you see something missing, let me know! I'm definitely trying to widen my horizons when it comes to short fiction venues. I now declare victory in my project to read pre-1939 genre classics! Have I read everything even vaguely genre related published before 1939? No, but I've read all the stuff that I want to, and everything that has been pointed out to me as important and/or influential. Altogether this project consisted of 45 books over roughly four years. In retrospect that doesn't sound like much, but that was squeezed in between all the other reading and work and &c.
This list doesn't include a lot of the really big, well-known classics--mostly because I'd read them in college or high school. I didn't feel the need to re-read all the Verne and Wells, or to revisit Brave New World et. al. This project was all about filling in the gaps, getting acquainted with the lesser known but still important pieces of the history. For archival purposes I wanted to put together this list, and that way I'll be able to reference it as needed. The list is ordered in the reverse order that I read them, most recent first. So what's next? The next big thing is the reading needed for the Egan book, and I'll be starting on that shortly. And of course I'm trying to stay on top of new short fiction for Salon Futura. But I'll also look to fill in a few gaps in my Golden Age reading (for instance I've never read Lest Darkness Fall or The Space Merchants). That's a much shorter list, and eventually I'll make my way to the New Wave, which will be another Major Undertaking. Of all of these the ones that I flat-out enjoyed the most were: King Solomon's Mines, everything by Stapledon, A Martian Odyssey, The Sword of Welleran and Others, and At the Mountains of Madness. The ones that I was simply glad to see the end of include: She, Galactic Patrol, The Moon Pool, everything by William Hope Hodgson, Lilith, and The Hour of the Dragon. 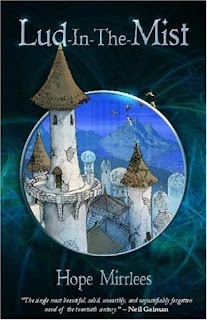 As I noted in this post, Lord Dunsany's The King of Elfland's Daughter didn't do much for me. Now that I've finished Hope Mirrlees' Lud-in-the-Mist with similar feelings, I wonder if I wasn't simply burned out on pre-Tolkein fantasy. I'd read rather a lot of it over the last year, and it was with a feeling of homecoming that I turned back to Olaf Stapledon's science fiction (to be covered in a later post). The transformation of Nat is a pretty dramatic one, and it's really the heart of the story. Most of the rest of the book is atmosphere and world-building as we learn about Lud, Fairyland and their historical relationship. There are also lots of satirical digs at English class relations. It's all pretty impressive, and I'm sure it was even more so for people reading it back in the 1920's. However, I found it to be easy to put down. Actually, I ended up putting it down for almost three weeks in the middle, which almost certainly didn't help me get a unified view of the book. Certainly being an American in the 21st century, the social commentary didn't really resonate with me. One thing that stuck with me is that the people of Lud felt very much like Hobbits. I assume that Mirrlees and Tolkein were drawing off the same source material for their characters. In that, Nat's journey from inaction to action is a bit like Bilbo's at the beginning of The Hobbit. Another interesting bit is that Mirrlees' Fairy is rather more threatening than Elfland in Dunsany. Elfland was a place of dreamlike stasis, but Mirrlees' fairy is a bit more active and almost meanacing, with various denizens running around spreading mischief. It felt more alien, and in that way one can see echoes with Neil Gaiman's work (who of course provides an introduction for the volume I read). Anyway, that wraps up my pre-Tolkein fantasy reading. What have I learned? Overall, there is a rich vein of Western fantasy that existed before Tolkein--he in no way sprang fully formed from the veins of the Norse eddas. (Not news to many of you, of course, but I had only known that in an academic way before.) You can definitely trace these early works through their influence on modern authors such as Gaiman and Kelly Link. Many of these early works are beautifully written (although some aren't: I'm looking at you, Worm Ouroboros!) and many are very psychologically and philosophically complex (I'm thinking of George MacDonald's Phantastes and David Lindsay's Voyage to Arcturus respectively). And of course, you've got the mix of satire, fluffy entertainment, and serious themes that we still find today. There's a lot of richness to be found in the literature of the late 19th and early 20th century. I'm very glad that I took this rather long tour through that history, I've found it to be entirely rewarding, even if I didn't uncritically love every work that I read. So the newest entry in the non-fiction-magazine-about-the-speculative-fiction-field has arrived! Salon Futura #1 is here, and it's got a lot of good stuff. There's a podcast with Gary K. Wolfe, Nnedi Okorafor and Fábio Fernandes, plus interviews with China Mieville and Lauren Beukes. Editor Cheryl Morgan covers the book reviews, Sam Jordison covers 19th century inventiveness, and Jonathan Clements writes on the passing of anime director Satoshi Kon. 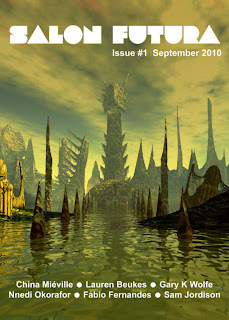 My contribution is a review of three short stories: "Coyote Barbie" by Cat Rambo (Expanded Horizons) , "Ice Moon Tale" by Eilis O'Neal (Abyss and Apex), and "Throwing Stones" by Mishelle Baker (Beneath Ceaseless Skies). I hope that you'll check it out and enjoy it! And now, (because what teh Internets need more of is my take on short fiction) here is my review of Ted Chiang's new novella. 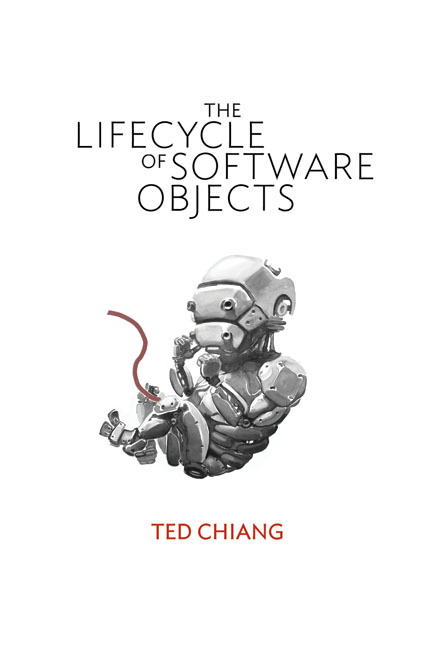 “Lifecycle of Software Objects” is available from Subterranean press, continuing their tradition of publishing top-rate stand-alone novellas from the field’s best authors. (To much success--I notice that "Lifecycle" is already sold out.) To drastically oversimplify the premise of this story: imagine digital pets that you could train--but that would have a human child’s potential to learn. Of course they’re very cute and responsive. They don’t cry and they go to sleep (suspended consciousness) when you tell them to. If you make a mistake, you can roll them back to a previous iteration and start over. Now imagine what happens to all these beings once their popularity fades. Our viewpoint characters are Ana and Derek. Ana is an animal researcher originally brought in by the digients’ developers to help with their pre-training. Each model of digient is trained up to at least a toddler’s level. Then copies of that trained version are sold to the public. Derek is a programmer who helped with the visual animation routines for the digients. They each adopt digients from the original models. Derek has Marco and Polo, two instances of a panda bear character who have the same genome but were trained differently. Ana has Jax, a copper-polished robot avatar that she helped train. We spend many years with these characters, getting vignettes at roughly one year intervals. Here Chiang takes full advantage of the novella’s length (“Lifecycle” is his longest piece to date): he is able to work through many variations and implications of the core idea of growing artificial sentient beings. There are good owners and bad owners, software hacks and platform issues. As the original digients’ popularity wanes, Ana and Derek remain part of a group of die hard owners doing their best to support them. Newer models come on the market. Jax, Marco, and Polo grow in sophistication and understanding of their own circumstances. Throughout these years, Derek has an unrequited crush on Ana. For a long time he’s married, but eventually he divorces. Inevitably, at just that time Ana moves in with her boyfriend. They remain in close contact over the digient issues. This subplot helps to motivate both the characters in various ways. It also provides a useful illustration that human decisions often aren’t made for ‘rational’ reasons. As the digients approach the age and capability level at which a human child would become an adult, it serves as a counterpoint: at what point should we trust another being with control of its own destiny? Everything in “Lifecycle” is laid out neatly, progressing neatly from Point A to Point B. The language is simple and smooth, told in present tense and not wasting any time. In addition to the saga of the main digients, we also get a fascinating array of variations on the same basic concept: digients trained to be OCD about game-playing, trained to be useful personal secretaries, trained (or untrained) to be aliens, given legal emancipation by their owners. It thoroughly covers a wide and thought-provoking amount of ground. It also has a rather timeless quality: for all that one can use analogies to things like Second Life and Tamagotchis, it feels like this could have been written twenty years ago or twenty years from now and been equally interesting. Nonetheless, I wasn’t as impressed by this as I have been by some of Chiang’s other works. While it is thorough and thought-provoking, I never got that opening-out, mind-expanding moment where my understanding changes in a ‘Wow!’ moment. That is a damn high standard to set--and one that only Chiang meets with any consistency, making its absence here more noticeable. It's also a very personal standard: "Exhalation" may not have had that effector on others, but "Lifecycle" may hit that sweet spot for someone else. In addition, I felt that the Ana/Derek subplot wasn’t entirely integral to the story, that it didn’t synchronize with the overall theme of the digient’s growth and potential. But at the end of the day there’s no question: this is one of the best sf short fiction pieces you’ll read this year. “Lifecycle” is well-written, thoughtful, and entirely award-worthy. And don’t forget the illustrations! 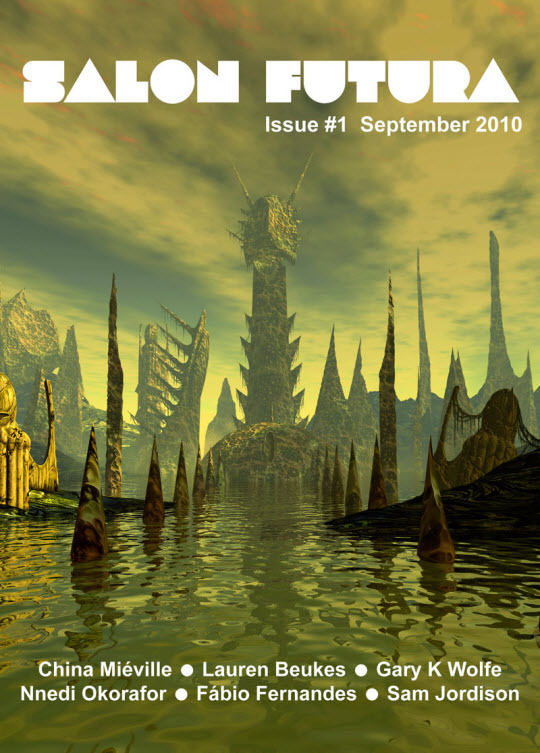 In Subterranean’s publication, Christian Pearce supplies spare but evocative illustrations, with the digient world in grey scale and the human world in red. They provide very effective amplification to the emotional beats of the story.